Dyes are substances, natural or synthetic, used to colour various materials, especially textiles, leather and foods. Natural dyes are so called because they are obtained from plants (e.g., Alizarin, Catechu, Indigo and Logwood), from animals (e.g., Cochineal, Kermes and Tyrian Purple) and from certain naturally occurring materials (e.g., Ochre and Prussian Blue). They have been almost entirely replaced in modern dyeing with synthetic dyeing by synthetic dyes. Most of these are prepared from coal tar, being formed from an aromatic hydrocarbon such as benzene, from which indigo is derived, or anthracene, which yields alizarin. Some materials e.g., cotton, silk and wood can be coloured simply by being dipped in the dye in a heated environment and so the dyes are consequently called direct dyes. 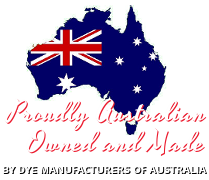 Dyes may also be classified according to the medium required in the dyeing process. Fibre reactive dyes may be classified as, either acidic, basic or bi-functional depending upon what environment they require to work in. TINTEX Low Temp dyes are basic reactive and require a caustic environment provided by the Setting Agent in which to operate. The most common commercial method of dyeing is vat dyeing (e.g., Indigo) whereby the dye is treated so that it becomes soluble and is then introduced to material bathed in a vat. On Removal from the vat, the dyestuff returns to its insoluble form. Jeans are dyed in this manner. The process by which a dye becomes attached to the material it colours is not definitely known. One theory is that a chemical reaction takes place between the dye and the fibre; another proposes that the fibre absorbs the dye. Dyeing is an ancient industry. The Chinese, Persians and Indians used natural dyes many centuries ago, including Indigo, the oldest dye in use and Tyrian Purple, derived from a species of snail. In the 13th and 14th centuries, dyeing assumed importance in Italy and the methods employed were carried to other parts of Europe. New Dyes were developed constantly from this time onwards, (e.g., Cochineal was introduced from Mexico.) until finally in the 19th Century the first synthetic dyes were produced by W.H. Perkin and Adolf von Baeyer. Use rubber or plastic gloves to protect hands from stains. Weigh, wash, rinse and spin garment, unfold and leave damp. Remove all stains. Choose container large enough to allow article to be well spread and to be moved about freely. Use sufficient water to immerse article completely. Dissolve the dye in a small container with hot water, at the rate recommended on the instructions for either High Temp or Low Temp Fabric Dyes. Stir well and strain through a clean old handkerchief or similar, to remove any undissolved dye. The depth of colour obtained depends on the amount of dye used. FABRICS APPEAR DARKER WHEN WET. Add a small quantity of dye solution to the water and test the colour with scrap cloth. Continue to add more dye solution to the dye bath until the resulting shade is as required. Remove the article from the dye bath before adding extra dye solution. Dyeing one colour over another will produce a blend of the two. A handful of common salt (about 250 gm) added to the dye bath when dyeing cottons helps to “fix” the colour. Any garment liable to shrinkage should be measured or traced in outline before dyeing, so that it can be restored to original shape and size when pressed damp dry. Shrinkage of woollens when using High Temp Dye is reduced by the addition of 1 tablespoon of vinegar per litre of dye solution. When dyeing cotton or linen in hard water, the addition of a little washing soda will assist dye penetration. Stains, faded areas and bleach marks will not be covered by the dye. Most stains can be removed with TINTEX Fabric Stripper. Materials with special finishes; e.g., waterproofing or “scotch guard” stain repellent will not accept dye. Garments carrying the instructions “dry clean only” usually are finished with a crease resistant dressing and this would limit the even absorption of dye. Use as many packs of dye as are required for the weight of the fabric to be dyed. The whole amount of material should be dyed together using the full amount of dye necessary. Dyeing in batches may result in slight colour variations as it is unlikely that the individual batches will be exactly the same. There may even be a slight variation in dye batches in production. Mixing all packs together eliminates this possibility.